For Part 1, see here; and be sure to sure the initial review at Amazon, if you have not read that yet. Here in Part 2, we will focus on the Introduction and some aspects in the section on Clement of Rome. This may be the sentiment and mis-understanding that Rod, in his experience, felt, and this is a very common idea about what Sola Scriptura is, but it is incorrect. Rather “Sola Scriptura” says that the Bible is the only infallible rule for faith, doctrine, and practice for the church. It does not say it is the “only” basis for Christian belief; rather it is the “only infallible rule”. So, Protestants believe in secondary authorities that are good and useful, but not infallible, such as local church elders/teacher/pastors/overseers, whose ministry is to teach the Scriptures properly and interpret the Scriptures properly(but we can never claim that any human is infallible); also consulting church history, historical theology, great writers and theologians of the past, ancient creeds, ancient councils, doctrinal statements, good exegetical commentaries. p. 13 – “I let the spirit of their pure and undefiled Christianity wash over me like a bath.” - The problem is that Rod left out a lot of material in recounting these 4 early writers, especially from 1 Clement and Irenaeus. p. 14 - Seems to imply that the early church fathers were more clear than the Scriptures themselves. page 25 – quotes from I Clement 7:4-5, but does not mention any of the actual contents of the letter of 1 Clement until page 83. On pages 83-93 is where he actually gets into the letter of 1 Clement. Why did he wait so long to actually get into the letter of 1 Clement? Seems to spend pages 25-83 to try and establish historical background from other writings, like Eusebius, Tertullian, Justin Martyr, Irenaeus, the Epistle to Diognetes, and the Didache – Rod seems to imply that the issue in 1 Clement was doctrine and Gnosticism, rather than what I Clement actually says, which is the rebellion and schism by some was from pride, arrogance, and jealousy that caused a group of younger men to rebel and depose the elders who were properly appointed as elders/overseers . He tries to show that Gnosticism was the issue in Rome in Clement’s time, but Clement never mentions Gnosticism as the cause of the schism and rebellion in his letter. While it seems true that Marcion went there around 140 AD, and maybe others earlier than that, that issue is not the issue that Clement is addressing. Clement mentions the sin of jealousy numerous times at the beginning of his letter and toward the end, as the cause of the disunity and schism, but Rod does not mention the jealousy issue very much, except at the end when merely quoting 1 Clement. Clement mentions pride and rebellion, jealousy, but not so much about fighting false doctrines of the Gnostics. As we mentioned in Part 1 of the Review of Four Witnesses, on page 87, Rod stops the quote of 1 Clement 44 as precisely the exact place that would show that overseers/bishops (Greek: επισκοποι - episcopoi ) is the same office as elders (Greek: πρεσβυτεροι - presbuteroi). This is clear in the earlier New Testament writings, such as Acts 14:23; 20:17, 28; Titus 1:5-7; 1 Timothy 3, 1 Peter 5:1-5, Philippians 1:1. Even other very early non-canonical writings confirm this, such as the Didache 15, and Irenaeus, Against Heresies, Book IV, chapter 26, no. 5. “Our apostles also knew, through our Lord Jesus Christ, and there would be strife on account of the office of the episcopate. For this reason, therefore, inasmuch as they had obtained a perfect fore-knowledge of this, they appointed those [ministers] already mentioned, and afterwards gave instructions, that when these should fall asleep, other approved men should succeed them in their ministry. We are of opinion, therefore, that those appointed by them, or afterwards by other eminent men, with the consent of the whole Church, and who have blamelessly served the flock of Christ in a humble, peaceable, and disinterested spirit, and have for a long time possessed the good opinion of all, cannot be justly dismissed from the ministry. Rod, used a different translation than the one above, but stopped the quote here on page 87 of his book. You can look at the standard ccel.org translation here. In this section on 1 Clement, he takes several shots at Sola Scriptura by mentioning that the New Testament canon was not completely known, discerned, collected under one cover, or decided upon yet. Yet the books already existed, being written between 48-69 AD and 80-96 AD. Some scholars even argue that all the 27 NT books were written before 70 AD. Sometimes, it even seems that Rod implies that the NT books and letters did not even exist until the 4th Century. p. 54 – “the church had been preaching the gospel, saving souls, and founding congregations all over the Near East for at least ten years before a single line of the New Testament was written.” While this is technically true, it seems the way it is framed is to make the reader downplay the importance of the written word. But no Protestant Evangelical denies that anyway. In fact we have no problem with oral preaching and the passages that speak of “tradition” – the truths that were passed down by oral teaching – 2 Thessalonians 2:15, 3:6; 1 Corinthians 15:1-3, 1 Cor. 11:1-2, 2 Timothy 2:2, Jude 3. Properly understood, there is no contradiction of these passages that mention "tradition" to Sola Scriptura, and there is no evidence that any of the later man-made Roman Catholic traditions were a part of these passages; none at all. Especially when we consider that 1 and 2 Thessalonians, along with Galatians, are the earliest letters of Paul, and he obviously taught the same gospel as he later wrote down in Romans, Ephesians, Philippians, etc. and so the "tradition" that he mentions is all later written out for us in later epistles/books. "But we should always give thanks to God for you, brethren beloved by the Lord, because God has chosen you from the beginning for salvation through sanctification by the Spirit and faith in the truth. It was for this He called you through our gospel, that you may gain the glory of our Lord Jesus Christ." Interesting that the apostle teaches the doctrine of election here in verse 13 - "for salvation" and he calls it "gospel" in verse 14. Later, he would flesh these doctrines out more in Romans chapter 9 and Ephesians chapter 1. So much for Roman Catholic "traditions" in 2 Thessalonians 2:15! The NT books just were not brought together under one “book cover” yet. In fact, books as we know them today, with a binding, did not even exist at that time. Each book and letter of the NT were individual separate rolled up scrolls. The codex form (sheets bound together) only started coming into being in the second century, and many scholars argue that it was the Christians in the second and third centuries that made the codex form in more wide usage. There were plenty of canonical lists consisting of the four gospels and Paul’s letters beginning around 160 AD. The Muratorian Canon consisted of the four gospels, Acts, all 13 of Paul’s letters, the book of Revelation, 1 – 2 John and Jude. Only James, Hebrews and 1 and 2 Peter are not mentioned. Clement mentions 1 Corinthians in his letter – 1 Clement 47 – “take up the epistle of the blessed Apostle Paul . . . “ (Rod quotes this on page 88 of his book). Even then, Clement exhorts the Corinthians to read the inspired letter to the Corinthians where Paul discusses the disunity issue and the groups that were fighting over whose teacher they liked better, whether Paul, or Peter, or Apollos, or even Christ. (1 Corinthians chapters 1-4) In the very context of the problem of disunity and which teacher certain groups followed, the inspired apostle models Sola Scriptura in principle as the way to solve the problem of arrogance, pride, competition and a spirit of jealousy over teachers, with the words, “do not go beyond what is written” in 1 Corinthians 4:6; and Clement seems to agree. Again, on page 55 – “What kept the body of Christ from falling into doctrinal chaos in a world where most (if not all) believers lived their entire lives without even knowing what the New Testament was?” Again, Clement quotes from OT and NT passages, and the emphasis is on jealousy, pride, disunity, and rebellion as the cause of the problem he is addressing in 1 Clement. A protestant would agree that that group of young men had no right to depose the duly appointed elders from their office. There is just no contradiction between Protestantism and 1 Clement on the matter of church government and leadership. p. 61- “Eventually, these Apostles will commit the commands of the Lord and Savior to writing, in their letters, in books, and in strange accounts of their prophetic dreams and revelations.” But Rod had just quoted 2 Peter 3:2 – “remember the predictions of the holy prophets and the commandments of the Lord and Savior through your apostles.” 2 Peter had to have been written around 66-67 AD, before Peter was executed by Nero in 67 AD. Maybe Peter dictated it to a disciple of his from prison just before he was executed. In that letter, Peter calls “all of Paul’s letters, “Scripture” – 2 Peter 3:16. So all of Paul’s letters and for sure the 3 synoptic gospels and Acts were already written by this time, along with 1 Peter. These are almost 30 years before Clement. p. 62 – “Yet even now, with the Bible still an unfinished symphony for years to come, the holy gospel of Jesus abides safely just where Jesus Himself deposited it – in the hearts of the men He called friends.” This again is the true in the sense of the books being collected together and put together in one binding, but it is not true as to their existence. Rod seems to emphasize that Clement had nothing to go by except the claim that he was taught by Peter himself and everything was all oral and in their memories and hearts. Rod emphasizes Simon Magnus and Gnosticism, by using Irenaeus’ and Justin Martyr's (pages 49-56) statements about Simon Magnus, but Clement makes no mention of this issue at all. p. 62 – “. . . the proud city of Rome must learn to look where Clement looked – to the simple man to whom the Good Shepherd said, “Feed My sheep.” Rod is trying to build the case that the deposit of correct doctrine was in the person of Peter, in his office as bishop of Rome or "Pope", in Rome, passed on to Clement, and that that was the solution to the problem of disunity and Gnosticism at the time of 1 Clement. Rod seems to imply that Clement is a "living voice" of authority and can solve the disunity problems by commanding obedience. p. 79 – After recounting the traditions of the death of the apostles, especially Peter being crucified upside down by Nero around 66-67 AD, Rod states, “Clearly this was a crucial moment in Church History. Her living links with Jesus were passing away, and she was still without a complete, authoritative Bible.” Interesting that Peter in his second letter, written from prison most likely, did not mention his successors or any kind of Papacy or him appointing a one man “mono-episcopate” and Peter did not say – “listen to my successor bishop of Rome” in his letter. Instead Peter kept saying, in 2 Peter 1:12-18 and 2 Peter 3:1, “this is the second letter I am writing to You” and “by doing this, by writing this letter, I am being diligent so that after I am gone, you will have something that can stir up your sincere minds and remember the truth. I have written about this principle several times before. This, 2 Peter 1:12-18 and 3:1, is clear evidence against any kind of Papacy or Roman Catholic sense of a successor in a mono-episcopate from Peter himself in the church in Rome, or any kind of infallibility doctrine, or any kind of superior jurisdiction of leadership of Peter being passed on. 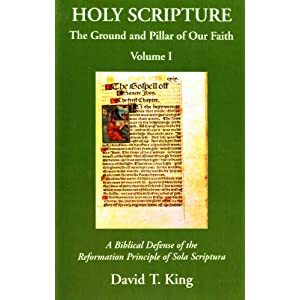 p. 11 – working from a wrong definition of “Sola Scriptura”, he seeks to build his case based on this mis-understanding, the whole rest of the way throughout his book. p. 14 – says the early church is clear and unambiguous. He seems to imply that the Scriptures are less clear. Roman Catholics seem to imply that Clement taught their version of apostolic succession in his time. This is not correct. “Why would Evangelicals disagree with such a concept of apostolic succession? Clement was writing to the church of Corinth in a context in which the leaders being opposed hadn't done anything wrong. Who would deny that there should be an ongoing succession of church leaders in such a context? He isn't addressing what should happen if the leaders would become corrupt, though his comments suggest that he would allow exceptions if corruption was involved. And the fact that some churches, such as Corinth, were founded by apostles doesn't imply that every church must have a line of bishops going back to the apostles. The only way to make this passage in Clement of Rome inconsistent with Evangelicalism is by reading assumptions into the text that neither the text nor the context implies. The last quote that Clement makes is from the LXX translation of Isaiah 60:17. Interestingly, the two offices of bishops and deacons are mentioned in The Didache 15, another very early non-canonical document (usually dated between 70-120 AD), and shows the earliest local church government was a 2 office leadership, not three. Namely, overseers/bishops and deacons. Philippians 1:1 also says the same thing: overseers (επισκοποις - episcopois - plural) and deacons. “For example, Roman Catholic scholar Joseph F. Kelly wrote in The Concise Dictionary of Early Christianity (1992, p. 2), “The word ‘pope’ was not used exclusively of the bishop of Rome until the ninth century, and it is likely that in the earliest Roman community a college of presbyters rather than a single bishop provided the leadership.” This is echoed by Protestant church historian J.N.D. Kelly who wrote:“In the late 2nd or early 3rd cent. the tradition identified Peter as the first bishop of Rome. This was a natural development once the monarchical episcopate, i.e., government of the local church by a single bishop as distinct from a group of presbyter-bishops, finally emerged in Rome in the mid-2nd cent. “ (J. N. D. Kelly, Oxford Dictionary of Popes, p. 6).“When speaking of Linus, Anacletus, Clement, Evaristus, Alexander, Telesphorus, and Hyginus (to A.D. 142), Kelly consistently notes the same thing: there was no monarchical episcopate in Rome at this time. In that same blog article, Jason Engwer provides two quotes by Jerome that are really telling as to the issue of presbyters and bishops being the same office. These were supplied by David King, co-author, with William Webster, of the 3 volume set, Holy Scripture: The Ground and Pillar of Our Faith. Brandon Addison has an extensive review of Lampe’s work on the early evidence for no mono-episcopacy in Rome. Moreover, Clement himself never claims that he is a "mono-episcopate" - a one man authority of a bishop over the church at Rome. In his letter, he clearly states, "The church of God . . . at Rome, to the church of God sojourning at Corinth". This is fully compatible with Protestant ecclesiology, but not with Roman Catholic ecclesiology. So, overall, Rod makes a very weak case for Roman Catholicism from the letter of 1 Clement. and the various links to other books and websites in the article above. Properly understood, there is no contradiction of these passages that mention "tradition" to Sola Scriptura, and there is no evidence that any of the later man-made Roman Catholic traditions were a part of these passages; none at all. Sola Scriptura by definition is a denial of another infallible authority. In order for you to say that the existence of tradition is not a deinal of sola scriptura, you would need to hold that the traditions were not infallible. Otherwise it is a contradiction. There is no contradiction of Sola Scriptura to the traditions that Paul mentions (2 Thess. 2:15 - since they are gospel truths mentioned in verses 13-14) and they are oral teachings that later written out in Romans, Ephesians, Philippians, and probably teachings he taught and had written in the letter to the Galatians. Same for "traditions" in 1 Cor. 11:2, 15:1-3, and Jude 3 (the things delivered once for all to the saints). A Roman Catholic has yet to find anything in those statements about "tradition" that came out centuries later - like purgatory or indulgences or Marian dogmas or Papal doctrines. So there is a difference between the mention of traditions in Scripture and later man-made traditions that came out centuries later and man made interpretations. So, there is no contradiction. "Hapax Paradidomi" - an interesting name you are going by - the dictionary forms of the phrase in Jude 3 - "once for all delivered"
It says that Scripture is the only infallible source that God has given the Church on-going access to. Paul's recipients knew the content of the traditions they had received. But we don't; you can't tell me what they were. Unless, that is, you can establish that God had guaranteed that those traditions would be infallibly transmitted by a means other than being written in Scripture. Even then, you would have to say how we know which ancient traditions actually trace back to what Paul mentioned. And as these arguments usually go, that means you'll appeal not to a infallibly transmitted tradition, but to the magisterial authority of the Church to sift out what is true. Yet both concepts are conspicuously absent from those passages. If you are right, it's because other passages teach one or both of those concepts. Either way, the "tradition" passages themselves still don't conflict with Sola Scriptura. Sola scriptura is a denial of the existence of another infallible authority. Scripture cannot be both affirming and denying the existence of another infallible authority. So what is it affirming? And why isn't that the norm if sola scriptura is true? Simply nonsensical. Unless, that is, you can establish that God had guaranteed that those traditions would be infallibly transmitted by a means other than being written in Scripture. Is the copying and redaction of scripture an infallible process? I don't think either catholic or protestant positions affirm that. Even then, you would have to say how we know which ancient traditions actually trace back to what Paul mentioned. We have this issue in determining which writings are even created via an act of inspiration in the first place. It is one thing to say that a writing is DEEMED as inspired (God breathed). It is another thing to say that you know that it was created by an act of inspiration. The only way you or I could say we know is by appealing to Tradition period. In that scripture endorses another infallible authority and sola scriptura denies the existence of it, yes there is a contradiction. I don't think it gets you off the hook by saying that sola scriptura is not concerned with what was going on in their day, it is concerned with today's norm. I find that whole logic lacking in that your sole infallible norm is scripture. Doesn't that mean what they say is their sole infallible norm, should be your norm as well? I guess a good question would be, how do you go about establishing from scripture that what was a norm for them (folks living during that time) would cease to be a norm for us? I mean an appeal to scripture is an appeal to what was normative for them. I don't see how the content being the same matters. The issue is not ultimately about wether there are two forms of content, but rather wether the oral medium can be infallible or not. Just ask Paul, when he wrote 2 Thess 2:15, if he could affirm the definition os sola scriptura, and he would have to say no on the basis that it contradicts what he does affirm both in word and practice. In essence you end up with Paul saying, 'it is not true now, but it will be true later'. Now if that is the case, can you honestly say that sola scriptura was a teaching delivered as one of the traditions Paul had in mind when he wrote 2 these? If catholics can not point to, say, the assumption of Mary as existing at the same time that Paul wrote 2 thess 2:15, then protestants likewise cannot say that sola scriptura existed at that time either. Sola Scriptura only fully kicks in, once the last book was written, whether it was Jude or Revelation. Your argument makes no sense to me, since even before Scripture is complete, there was emphasis on "thus it is written" (OT) and "do no go beyond what is written" ( 1 Cor. 4:6) and John 20:30-31 - these are witten so that you may believe that Jesus is the Messiah, the Son of God, and that by believing you may have eternal life"
I John 5:13 - "These things I write to you so that you may know that you who beleive in the Son of God may have eternal life"
1 Timothy 3:14 - "I write these things to you . . . so that you know how to conduct / behave in the household of God, the church " etc. Ken, obviously if their view of scripture, when they said "it is written" didn't exclude other infallible authorities, then they couldn't have even been implying sola scriptura. The logical take away from this is that it is possible to say "it is written" without denying the existence of another infallible authority. Why interpret "it is written" to be "a kind of Sola Scriptura in principle" when you can and should interpret it for what it is, "it is written" along with another infallible authority. If anyone can say that is a kind of "another infallible authority", then I can but that would be understating what scripture teaches. The apostles once for all delivered "a kind of sola scriptura". They sorta denied the existence of another infallible authority and then handed that doctrine of denial on as part of the faith once for all delivered? "It is written" and passages such as Matthew 15 and Mark 7 imply Sola Scriptura, because all "traditions of men" must be tested against the Scriptures. But since the full canon was still being written, your logic is flawed. All Roman Catholic doctrines and dogmas and practices are man-made traditions, additions, corruptions, and things that eclipsed the truth of Scripture. All Roman Catholic doctrines and dogmas and practices that Protestants have always objected to are man-made traditions, additions, corruptions, and things that eclipsed the truth of Scripture. I did not mean to put good Scriptural doctrines like the Trinity and the resurrection and virgin birth of Christ in that statement, obviously. Since it is so blatantly clear that Sola Scriptura is a post apostolic tradition, it follows that either the teaching of the apostles developed from "KINDA" teaching sola scriptura to eventually sola scriptura in full form or sola scriptura, by your own criteria isn't even binding on the conscience of christians and is not a central issue for protestants and can be discarded at anyone's whim. Sola Scriptura is not man-made because once the last book was written, whether if was the book of Revelation or the epistle of Jude, the faith was delivered "once for all" - but all the books were written as separate and individual scrolls in different places to different places over that period of about 48 AD to 69 AD or to 80 AD or to 96 AD. Since the last book written is God-breathed (2 Timothy 3:16), that is, inspired, then it is automatically "canon" (criterion, standard, law) at that moment. So, God said it was "canon", criterion, standard, law at the moment it was written, by saying it is "God-breathed". Whatever is "God-breathed" is canon by definition. So, because they were all individually separate and written by different people to different places over that period of years, 48-96 AD, and they were under persecution, difficulty of getting them all together under one "book cover" / codex form didn't even exist until mid second century and was not widely used until much later, this explains why it took a while for the historical process of sifting and discerning and testing and witnessing which books were actually "canon" in the first place. So, I don't accept that Sola Scriptura is a "man-made" doctrine, because it flows out of the nature of the 27 books being "God-breathed". If "God-breathed", then they are 'canon" and if canon, then Sola Scriptura flows logically from that. Your principle requires that the apostles have taught sola scripture in order for it to be considered as being from God (as opposed to man made). In fact per your argument, sola scripture doctrine had to have been delivered by the time that Paul wrote 2 these 2:15. So are you asserting that when Paul made reference to traditions delivered in 2 these 2:15 that he was referencing indirectly, the doctrine of sola scripture? You don't seem to be understanding or reading what I wrote. You don't seem to understand the argument; or you are being deliberatly obtuse. Ken, I am not understanding you. Where I am not understanding you at is when you require all catholic Traditions in full form to have been delivered by the time that 2 thess. 2:15 was written but you don't require sola scriptura in full form to have been delivered as a tradition by that time. This is evident in your last reply to me which makes it clear that sola scriptura was non-existent until the last book of the bible was written. Why does SS get off the hook here but catholics Traditions do not? Ken, I apologize for my previous reply which was confusing. Ok, that's more clear at least in my ability to understand what you are saying. The reason is because the emphasis in the NT is on "thus it is written" and "you have nullified the commandments of God by your traditions" (Matthew 15/ Mark 7) and "do not go beyond what is written" (1 Cor. 4:6), and "these things I write to you so that . . . " (1 John 5:13; John 20:30-31; 1 Tim. 3:14-15; Luke 1:1-4; 2 Peter 1:12-21; 3:1; 2 Tim. 3:16-17), etc - all show Sola Scriptura in principle, and that when the last book was written, the aggregate result is full flegged Sola Scriptura, since the only way to know what Paul was referring to as to what the oral traditions were that he was teaching the Thessalonians aside from his letters, were the details about the truth and gospel that he also wrote about in Romans, Ephesians, Philippians, Colossians, I - 2 Cor, 1 Timothy, Titus, 2 Tim. etc. There is just no evidence for those traditons that were added slowly later over centuries. But Roman Catholic traditions are not even in anything in Scripture, not even in seed form - nothing - no Papacy, no infallible mono-episcopate of Peter, no infallibility of interpretation, no NT priests, no ex opere operato automatic working of a ritual; no perpetual Virginity of Mary (as Matthew 1:18, 25 and 13:55-56 - "brothers and sisters" makes clear); no mediation by Mary (clear contradiction to 1 Timothy 2:5); no Immaculate Conception, no bodily Assumption, no purgatory, no indulgences, no Latin "do penance", no prayers to dead people or visiting graves, no graven images in worship - no transubstantiation - nothing of that stuff is even hinted as in 2 Thess. 2:13). Cyprian was clear around 258 AD - "no one has the right to claim that he is bishop over all the other bishops" (summary of 7th Council of Carthage with 86 bishops, including Firmillian; all against the arrogant claims of Steven, who was bishop of Rome, but was never a "Pope". To read any of that stuff back into 2 Thess. 2:15 is very anachronistic. Hapax understands the argument perfectly well. If SS was not operative when the Apostles were writing, how can the verses you cite support it? How do you not violate GHM which Protestantism claims is the only valid way to exegete Scripture and authorial intent by imposing such a meaning to their words? "Sola Scriptura is not man-made because once the last book was written, whether if was the book of Revelation or the epistle of Jude"
As Hapax mentioned, that you think revelation is closed and that those books are inspired and not others comes from Tradition - they are not derived from SS. "Since the last book written is God-breathed (2 Timothy 3:16), that is, inspired, then it is automatically "canon" (criterion, standard, law) at that moment." Inspired books were canonical when written. That's never been the issue - the issue is recognition/identification of those books and whether they are the sole infallible authority. How can SS operate with a fallible collection of books? It seems for SS to be a sole infallible rule of faith, the canon would have to be infallible as well given its rules of Scripture interpreting Scripture and the canonical hermeneutic required for proper interpretation of any passage. Any notion of development of the canon, or fallibility or non-closure of the canon, defeats SS as a coherent and consistent principle. "Whatever is "God-breathed" is canon by definition." It still needs to be identified and recognized. "this explains why it took a while for the historical process of sifting and discerning and testing and witnessing which books were actually "canon" in the first place." So the canon/SS developed. How SS could operate coherently when the canon was not finalized (and even at that, only fallibly as Protestantism says) for centuries escapes me. "If "God-breathed", then they are 'canon" and if canon, then Sola Scriptura flows logically from that." No, just because inspired Scripture exists does not mean it flows logically that it is the sole infallible authority or there are no parallel authorities. The fact that Scripture is interpreted as witnessing to other parallel authorities by non-Protestants shows SS does not logically follow. And if SS is self-defeating in principle, that obviously shows it does not logically follow and that parallel authorities must be presumed. And so whether scripture explicitly testified to those parallel authorities would be irrelevant; it would be necessarily presumed and further any explicit witness to its own authority would therefore implicitly witness to the parallel authorities by necessity. "2 Peter had to have been written around 66-67 AD, before Peter was executed by Nero in 67 AD. Maybe Peter dictated it to a disciple of his from prison just before he was executed. In that letter, Peter calls “all of Paul’s letters, “Scripture”"
You have to establish 2 Peter's authenticity first. There's a reason it was one of the most disputed NT books due to authorship issues. Even Calvin used question-begging post hoc reasoning when stretching the concept of apostolic authorship in recognizing it as canonical. Secondly, "Paul's letters" do not therefore identify his writings. Some writings were rejected that claimed his name. Other included writings are disputed to have been written by him by many scholars (the pastorals). So it does no work for you in building the canon from scratch, which you should be able to do according to SS principles - ie, using self-attestation and inner witness alone - any other criteria creates a canon above the canon as Ridderbos and Calvin both prohibited using when identifying the canon since they recognized appealing to such external criteria/authorities in building such was ad hoc and inconsistent with SS. A later comment of his was more clear. If SS was not operative when the Apostles were writing, how can the verses you cite support it? teaching that Mary was a perpetural virgin or that we can pray to her or that it is ok to have statues in worship/devotion contexts or transubstantiation or that works can save you. You just have no evidence that they were being taught during that time from 30 AD – 96 AD. The different 27 letters prove this, as they cover all that we need for life and godliness – 2 Peter 1:3-4. Whatever is God-breathed and given to us is sufficient to equip us for the ministry. 2 Tim. 3:16-17. I already said all this, but you guys just don’t seem to want to understand. Grammatical – Historical-Method – yes ; but we are not violating it. which Protestantism claims is the only valid way to exegete Scripture and authorial intent by imposing such a meaning to their words? It’s not imposing anything on the words, rather it is just the natural understanding that once the writings are finished, there is no more revelation, since the faith was once for all delivered, and it was all written down and the Roman Catholic doctrines contradict the NT, therefore they are wrong, since they are non-existent in 2 Thess. 2:15. Historical reality and fact is just historical reality; it is not a man-made tradition, like the way Rome tries to read the Papacy back into Matthew 16:16-18. You do what the Pharisees do in Matthew 15/ Mark 7 – adding to Scripture and nullifying the word of God for your traditions. Inspired books were canonical when written. yes it is the issue. It means that the case is closed and Sola Scriptura is true. They got recognized and discerned because they were already true and existed, as others have written, the weightiness of them forced themselves on the church by their own power; there could be no other reality otherwise. they are God-breathed; since they are God-breathed, then canon, and since canon, then Sola Scriptura applies. and whether they are the sole infallible authority. Since God is infallible and man is not; then only the God-breathed Scriptures are infallible. People make mistakes; the early church made mistakes, teachers make mistakes; so they are not infallible. Greek word "mono" is later communicated by the Latin, "sola" = "only", "alone"
By putting Scripture above councils and showing that Scripture was the basis for a council’s decision, he taught Sola Scriptura as the final court of arbitration. How can SS operate with a fallible collection of books? Since each one was written individually, collecting them together makes them automatically infallible and complete; since there is nothing else from the apostles. All of the issues that later come up have to be tested by that standard/criterion. It seems for SS to be a sole infallible rule of faith, the canon would have to be infallible as well given its rules of Scripture interpreting Scripture and the canonical hermeneutic required for proper interpretation of any passage. Rules for interpretation come from the normal rules of logic and communication – according to the author’s intended meaning and according to the literary genre. It doesn’t have to be spelled out; respect for the person writing the letter automatically means that he seek to understand him as he wants you to understand him. Anything else is dishonesty and leads to breakdown in communication. If a mother or father write a letter to their son or daughter at college, love and respect require them to take their words as their mother and father intended them. We must take Moses, David, Solomon, Isaiah, Jesus, Matthew, John, Paul, etc. as they intended. Since the Scriptures are inspired/God-breathed, we must take them as the way God intends us to understand them. Any notion of development of the canon, or fallibility or non-closure of the canon, defeats SS as a coherent and consistent principle. More tomorrow; Lord willing; I am tired. It is 1:00am and writing all this out is exhausting. Which it was and so there is no need to struggle over that. It is finished. Peace. Let the peace of Christ richly dwell within you. Colossians 3:16 No need for skepticism or doubt “what if the early church got it wrong?” is a weird skepticism about history. The radical doubting of reality by the Roman Catholic approach to assurance and certainty can lead to madness or obsession or mental instability. from 48-96 AD while being written, yes; because it was progressive revelation at that time, beyond that no, it did not develop. But human discerning of what was already canon did develop. (100-250 (Origen's list of 27 books - same as Athanasius) to Athanasius' list (same, 367 AD) Big difference. How SS could operate coherently when the canon was not finalized (and even at that, only fallibly as Protestantism says) for centuries escapes me. If they all existed, then it was there. That churches did not have all the 27 books until later didn’t obviate the truth that they were there in time and space. No, just because inspired Scripture exists does not mean it flows logically that it is the sole infallible authority or there are no parallel authorities. The fact that Scripture is interpreted as witnessing to other parallel authorities by non-Protestants shows SS does not logically follow. No, because Roman Catholics and E. Orthodox are exalting men/humans above the Scriptures by exalting their bishops and Popes and Patriarchs to rule over Scripture. it is not self-defeating; rather it is self-evident. that obviously shows it does not logically follow and that parallel authorities must be presumed. Local churches are secondary authorities; not infallible. Only Scripture is infallible. And so whether scripture explicitly testified to those parallel authorities would be irrelevant; it would be necessarily presumed and further any explicit witness to its own authority would therefore implicitly witness to the parallel authorities by necessity.
? I confess I don’t understand that statement. You have to establish 2 Peter's authenticity first. No need; it is already established. No need to re-hash that. It is self-evident as God-breathed and canon. There's a reason it was one of the most disputed NT books due to authorship issues. Probably because a student of Peter wrote it as Peter dictated it to him while in prison awaiting his execution. Obviously as Mark wrote Peter’s gospel and Silvanus wrote 1 Peter for him ( 1 Peter 5:12); then this fits that another disciple of his wrote 2 Peter and it took a while for it to become known. Even Calvin used question-begging post hoc reasoning when stretching the concept of apostolic authorship in recognizing it as canonical. Secondly, "Paul's letters" do not therefore identify his writings. They don’t have to, because it says “in all of Paul’s letters”. And 2 Timothy was written around same time as 2 Peter, so it includes all of them. Some writings were rejected that claimed his name. Yes, because they had content and self-evident Gnostic stuff and heretical ideas. It was self-evident. Other included writings are disputed to have been written by him by many scholars (the pastorals). I don’t care what those liberal scholars think or say. They are wrong. Yes; it works just fine. And the added testimony of history and the early church. any other criteria creates a canon above the canon as Ridderbos and Calvin both prohibited using when identifying the canon since they recognized appealing to such external criteria/authorities in building such was ad hoc and inconsistent with SS. No, it doesn’t created a “canon above the canon”, nor is having history and reality testify to something somehow “ad hoc” or inconsistent; no. but they are good and refuted Roman Catholic arguments. Above should have been Colossians 3:15 - "Let the peace of Christ rule in your hearts . . . "
I wrote an article a couple of years ago on the doubt and skepticism about the canon that Roman Catholic apologists constantly use. It leads to unbalanced thinking, mental instability, potentially madness and is unhealthy. That seems to be the root bottom line method that Newman and Hahn and Matatics and all other former Protestants go through and then use. I see no value in that kind of radical skepticism about history and assurance and certainty. "The principle of Sola Scriptura is there generally as more books are written; then once they are all written, it automatically, ontologically and by nature “kicks in”"
This is all just assertion. "You just have no evidence that they were being taught during that time from 30 AD – 96 AD." Did Protestant doctrines develop or not? You are also treating Tradition as if its just a set of propositions. "The different 27 letters prove this, as they cover all that we need for life and godliness"
The different 27 letters you recognized via Tradition you mean. I also assume we don't need to bother with the OT now. "Whatever is God-breathed and given to us is sufficient to equip us for the ministry. 2 Tim. 3:16-17. " Profitable and useful, not sufficient. "Grammatical – Historical-Method – yes ; but we are not violating it." Please explain where GHM allows for interpreting authors contrary to their intent. Or using other authors and writings from different centuries or genres to interpret them. "It’s not imposing anything on the words, rather it is just the natural understanding that once the writings are finished, there is no more revelation, since the faith was once for all delivered, and it was all written down and the Roman Catholic doctrines contradict the NT, therefore they are wrong, since they are non-existent in 2 Thess. 2:15." "Historical reality and fact is just historical reality"
Hand-waving. Revelation is closed because historical reality shows revelation is closed. The Protestant canon is an article of faith to be assented to because historical reality shows the Protestant canon is an article of faith to be assented to. What? "it is not a man-made tradition like the way Rome tries to read the Papacy back into Matthew 16:16-18. You do what the Pharisees do in Matthew 15/ Mark 7 – adding to Scripture and nullifying the word of God for your traditions." Do you realize anyone you disagree with can say the exact same thing to you about man-made traditions? "yes it is the issue. It means that the case is closed and Sola Scriptura is true." "they are God-breathed; since they are God-breathed, then canon, and since canon, then Sola Scriptura applies." "Since God is infallible and man is not; then only the God-breathed Scriptures are infallible. People make mistakes; the early church made mistakes, teachers make mistakes; so they are not infallible." Okay so Scripture is infallible, but our identified canon might be mistaken, but Scripture interprets Scripture and it's our sole infallible authority. Not compelling. "Athanasius said several times in several famous statements that"
Why do I care what Athanasius says? You don't care what he says about other things. "Since each one was written individually, collecting them together makes them automatically infallible and complete; since there is nothing else from the apostles. All of the issues that later come up have to be tested by that standard/criterion." More question begging and assumptions all over the place. "Rules for interpretation come from the normal rules of logic and communication – according to the author’s intended meaning and according to the literary genre." So the word of God is to be interpreted just like any secular piece of writing. Articles of faith can be deduced from Scripture just like someone putting Scripture into a laboratory and extracting samples from it. "It doesn’t have to be spelled out; respect for the person writing the letter automatically means that he seek to understand him as he wants you to understand him"
So why do GHM practitioners and erudite scholars disagree on the meaning? "Since the Scriptures are inspired/God-breathed, we must take them as the way God intends us to understand them." Exactly right. He intends us to understand them in the Tradition they came from and within the proper interpretive community. "It is self-evident and self-authenticating." So why did the church not get all of it right for 400 years? Why did the early church who got the NT right then get the OT wrong according to you? Were they just unreasonable or spiritually blinded? "If they all existed, then it was there. That churches did not have all the 27 books until later didn’t obviate the truth that they were there in time and space." Of course they existed. But if they were not recognized, how could SS operate then? "And so whether scripture explicitly testified to those parallel authorities would be irrelevant; it would be necessarily presumed and further any explicit witness to its own authority would therefore implicitly witness to the parallel authorities by necessity.
? I confess I don’t understand that statement." If SS is self-defeating, then Scripture necessarily functions as an authority with parallel authorities. So, even if the RC/EO interpretation of scripture witnessing to other authorities is wrong and it really did not explicitly testify to any parallel authorities, that would be irrelevant, since any witness to its own authority would implicitly presume and witness to the parallel authorities. 2. SS itself not being taught by Scripture according to GHM principles. 3. That we can't have infallible interpretations/teachings due to our sin-corrupted minds. If you disagree, you have to do more than just reassert your position and continuing to assume what needs to be proven. "No need; it is already established. No need to re-hash that. It is self-evident as God-breathed and canon." Okay. Rome's authority is already established. It is self-evident. You convinced? "I read Calvin’s comments on that some time ago. (at www.ccel.org) I haven’t memorized it, nor can I regurgitate his argument. But you need to explain what you mean by “question-begging post hoc reasoning”"
"If it be received as canonical, we must allow Peter to be the author, since it has his name inscribed, and he also testifies that he had lived with Christ: and it would have been a fiction unworthy of a minister of Christ, to have personated another individual. So then I conclude, that if the Epistle be deemed worthy of credit, it must have proceeded from Peter; not that he himself wrote it, but that some one of his disciples set forth in writing, by his command, those things which the necessity of the times required. For it is probable that he was now in extreme old age, for he says, that he was near his end. And it may have been that at the request of the godly, he allowed this testimony of his mind to be recorded shortly before his death, because it might have somewhat availed, when he was dead, to support the good, and to repress the wicked. Doubtless, as in every part of the Epistle the majesty of the Spirit of Christ appears, to repudiate it is what I dread, though I do not here recognize the language of Peter." He's allowing its canonicity to influence how he accepts it as canonical (assuming what he needs to prove), and so he reasons that even though it wasn't authored by Peter, it must have been authored in such a way as to be approved by him. He is stretching the concepts of inspiration and apostolic signature in light of the textual evidence - he's conjecturing based on theological, not historical-critical reasons. "I don’t care what those liberal scholars think or say. They are wrong." Okay so apparently it's not self-evident then. You're just engaging in pure fideism then. Not compelling. "Yes; it works just fine. And the added testimony of history and the early church. " That's the canon above the canon. You mean parts of the early church you agree with. You don't agree with them on the OT or other beliefs they held, so appeal to them is ad hoc. Either the early church is authoritative or it is not. If it is, SS is self-defeating in that it can't operate without that authority identifying Scripture. "I see no value in that kind of radical skepticism about history and assurance and certainty." I agree. The problem is such skepticism is justified according to your own principles, not mine. I appreciate your tenacity and zeal; but you are also just as unconvincing since the height of fideism is the Roman Catholic church - "we are the one true church because we say so", and been claiming it for centuries - sometime after Gregory I around 601 and especially from the 900s forward to today - but even before Stephen, bishop of Rome was rebuked by Cyprian, Firmillian and some 85 other bishops from all over the Christian world around 257-258 AD. etc. Pius IX - "I am the tradition" (1870 and the infallibility dogma. historian Ignaz Von Dollinger and lord Acton rightly oppossed that madness. Boniface VIII - 1302 - Unam Sanctum - "It is necessary for every human creature to be subject to the Roman Pontif ( Me !) in order to be saved." One of the most, if not the most arrogant statements ever uttered by anyone. Of course Protestant doctrines develop, but they are more closely based on sound exegesis - the Historical - Grammatical Method, as you even pointed out. The Rule of Tradition, or "the faith" or "the Preaching" or "the tradition" in Irenaeus, Tertullian, Origen, and Athanasius was a basic doctrinal outline very similar to the Apostles Creed, Nicean Creed, Constaninopolitan Creed, Athanasian Creed, etc. - there is nothing in them that is not basic bibical doctrine that we agree on. they never say the distinctive Roman Catholic doctrines (which all come much later) are in those lists. In a future article, I am planning to quote those passages from those 4 early church fathers. Jerome very well studied the Apocrypha books and his understanding is the correct one, even though some early church writers/fathers quoted from some of those books as if they were Scripture. Jesus in Luke 11:51-52 - from the blood of Abel to the blood of Zechariah the priest - ie, from Genesis to Chronicles. The Jews - 400 BC - counsel of Jamnia, Talmud, etc. All those agreed that the Apocrypha was not Scripture. "Of course Protestant doctrines develop, but they are more closely based on sound exegesis"
So you're fine with development. Then it shouldn't be a dealbreaker when you don't find a current teaching explicated in the 2nd century. You say they are based on "sound exegesis - meaning GHM". This is another assumption on your part. Where does Scripture teach that the only valid way to exegete it is via GHM? Did the early church when battling heresies only use GHM when hammering out core doctrines? I am not anti-GHM - it is useful, but GHM by its nature is limited and does not make any claims to yield divine truths by its application (or whether other exegetical methods should be used with it), and further, can change with developments in scholarship in the various academic fields that drive and inform it. What it “proves” is nothing but plausible opinion, not articles of faith. The OT was accurately interpreted by a divine authority, not scholars practicing GHM alone. "there is nothing in them that is not basic bibical doctrine that we agree on." The problem is this "doctrine" is just probable opinion by your own admission. And groups who hold to those creeds interpret them differently than you do so there is not actually agreement. And fathers held beliefs as part of the faith that you disagree with. "even though some early church writers/fathers quoted from some of those books as if they were Scripture." That's why your appeal to them as support for your canon is ad hoc. As is your appeal to inner witness and self-evidentiary nature - the ones you disagree with were either unreasonable or spiritually blinded according to your criteria, but only when they disagree with you, not when they agree with you.